CONCRETE REVOLUTIO: This series… Well, it… Okay, umm… All right. 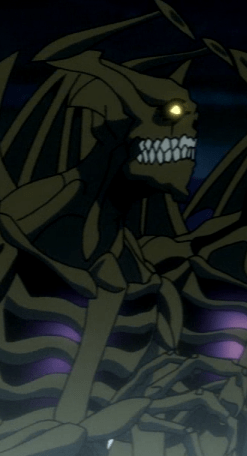 To start with, in a review of the first episode, Anime News Network’s Theron Martin gave the show an i or an imaginary number on a scale of 1 to 5. I think he was right! According to Wikia and other numerous sources, the show takes place about 20 years after World War II in an alternate timeline. Beings from multiple dimensions/worlds come together on Earth. Some are good, some not so much. Kikki Hoshino is a magical girl who is trying to hide among humans as a waitress. Capture from Funimation’s stream. One of the main characters is Kikki Hoshino, who, when she’s not working as a waitress, is a magical girl. She meets Jirou Hitoyoshi, a member of the Superhuman Bureau, in one of the three timelines in the first episode. She’s been working with him for years in another part of the plot; she’s his enemy in a third. The plot jumps forward and back and forward several times. A little hard to follow, but not impossible. 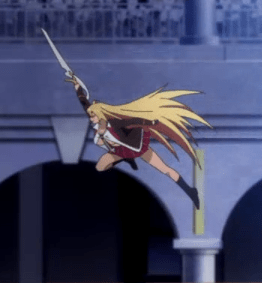 The animation backgrounds remind me of 1940s and 1950s printed color comics, and the mix of magic and super powers and action is exiting to watch but often hard to follow. I think the writers are trying something epic here. Even if it fails, I suspect the attempt’s going to be worth watching! Dance with Devils: This series introduces Ritsuka Tachibana, a model student in her second year of high school. Before going to school every day, her mom makes sure Ritsuka wears her locket. Good thing, too, because the student council present calls her into his office and attempts to enslave her with his magic. Apparently, he and the other student council members (all male) are demons. Her locket protects her, but she was in a trance the whole time, so she didn’t know what he had tried to do. She returns home to find two other men assaulting her mom and ransacking her house. Looks like the men in her life leave something to be desired! Her mom manages to convince the hiding Ritsuka to leave and call for help. Of course, the police find nothing — by the time they arrive, the house is completely clean and her mom is nowhere to be found. So, she called Lindo, her brother and an exorcist overseas, who agreed to come back to help, but only after telling her to stay with a friend. Shockingly, the same men (demons?) who assaulted her mom attack her, and the president of the student council intervenes on her favor. I’m not sure I’m the target audience for this show (so… many… males…), but the animation is beautiful, and Ritsuka seems like a sympathetic lead. Garo Crimson Moon: Set in the Heian period in Japan, the first episode begins with carpenters trying to repair a spirit wall. Horrors are as mean as they look. Hungry for humans, too. Capture from Funimation’s stream. They apparently don’t notice how late it’s getting, because the sun goes down and Horrors rise from the earth and attack them. Fortunately for the surviving carpenters, a Makai Alchemist named Seimei shows up to slow them down until Raikou, our hero and a Makai Knight with Golden Armor, can finish them off. The scene shifts to the imperial court to meet Michinaga, lord of the Light Palace, who apparently likes beautiful scenery and women but not his people. The scene establishes that spirits, though no danger to the elite, are an omni-present danger to the poor who have to travel at night — and spiritual attacks are on the rise. The animation is fluid and lush. I’m waiting to see if the characters develop a similar depth! I hope so, because the battles were fun to watch. 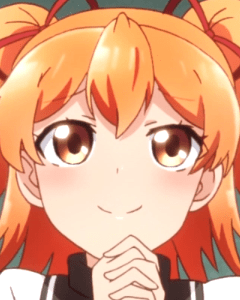 Shomin Sample: A show with an elite all-girl high school where each student has her own maid: what’s not to like? Well, for starters, the show begins with a kidnapping. Kimito Kagurazaka was a seemingly normal student at a normal high school when a team of posing muscle builders abducts him on his way home from school. A maid explains that he’s been selected because he’s a commoner, and the school needs commoners to teach the elite girls how to interact with the little folk. The Jeffersonian in me is appalled at the concept! As if hapless Kimito weren’t humiliated enough, they also chose him because their surveillance showed that he was gay, which was why they sent the muscle builders to abduct him. When he protests, the maid says that if they were mistaken, they would have to drop him on some isolated island, sans genitalia, for the rest of his life, because a) they can’t divulge the school’s secret existence and b) can’t let a heterosexual male loose among so many innocent high school girls. Aika just wants to be a common girl so she can be the most popular in class. Too bad she’s so gullible. Capture from Funimation’s stream. To add to his joy, the maid assigned to him, Miyuki Kujou, hates commoners and talks down to him. Rarely have I seen such a sympathetic main character. He eventually meets Aika Tenkuubashi, who’s shy but harbors a dream to be the most popular girl in class. She’s really gullible, which leads to many funny moments, but at this stage of the series, she is the least condescending to Kimito. Though it deeply offends my social sensibilities, I’m going to keep watching it for the chemistry between Kimito and Aika. Plus, despite my initial misgivings, some of the other girls are less intentionally elitist and more just a product of their upbringing and training. If the show’s really, really good, it’ll dramatize some of that tension. Valkyrie Drive Mermaid: I thought that The Testament of Sister New Devil: Burst was risque (and, well, it is!). This, however, takes things to a new and guilty level. To put it into context, the title of the first episode is “I’m Getting Deflowered.” Yeah. That. The story starts with Mamori Tokinome as a baby. Her parents find that she’s infected with something that’s apparently life-altering. It makes her mom weep. The story fast forwards to the present, where Mamori is in gym class. Strange men abduct her, and she awakens on a beach. She finds two bikini-clad women lounging there, and she thinks she’s saved. Then, the brunette starts making out with the blonde, who becomes more and more excited until she — wait for it! — turns into a weapon. A novel way to un-holster a weapon to be sure. Apparently, one of the pair is always a wielder and the other is always the weapon. Mirei with Mamori, who’s in sword form after being un-holstered. Capture from Funimation’s stream. The story reveals that the two are attacking Mamori to test her, and this seems to happen to all newcomers. 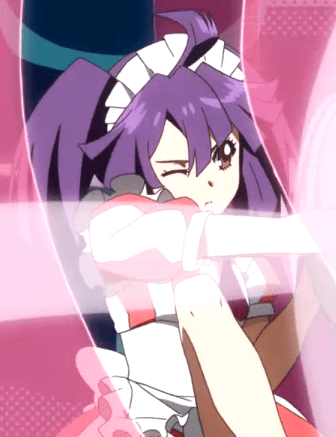 Mirei Shikishima interrupts the battle with her arrival, also as a newcomer, and she protects Mamori. They make a run for it and end up at the school. Again, no safety there! They’re immediately attacked, and Mirei shows that she’s familiar with how things work on this island. She gets intimate with Mamori until the latter turns into a sword. Of course, there are light bars galore in the first episode. I have to say that the concept is novel. I’ve never seen an anime where getting sexually excited means turning into a weapon. I hope for Mamori’s sake, and the sake of the other weapons/girls, that sexual excitement won’t always turn them into weapons. Otherwise, they might feel a bit deprived. I think the Summer 2015 schedule had me spoiled. Titles like Overlord and Blood Blockade Battlefront really resonated with me. This time around, I have high hopes that CONCRETE REVOLUTIO will break new dramatic ground. Otherwise, the best I think I can hope for is entertainment. That’s not a bad thing! But it’s Funimation’s fault for spoiling me last season. I might be wrong and some of the other series will surprise me. Only time and their talent will tell!